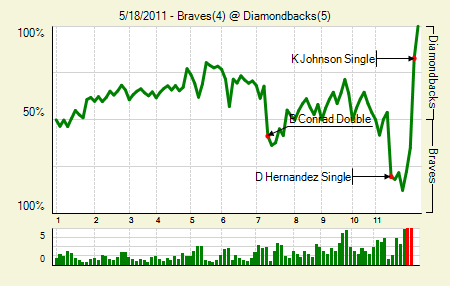 Moving the Needle: Kelly Johnson ties the game back up in the 11th, +.479 WPA. Extra innings can break your heart. The Braves took the lead in the top of the 11th and sent out their closer to take care of the final three outs. He got the first, but then allowed four straight singles to end it. Johnson got the tying one, and then Justin Upton capped things. Justin Upton: 2 for 6, 1 HR. He got things started in the bottom of the first with a solo blast. Chipper Jones: 2 for 4, 1 2B, 1 BB. He walked to lead off the 11th, but his pinch runner got nailed trying to take third on Dan Uggla’s single. Moving the Needle: Robinson Cano’s rocket into the gap scores the go-ahead runs, +.262 WPA. They weren’t even supposed to get this far. The Yankees had a 1-0 lead heading into the ninth, which mean that Mariano Rivera would come on to close things out. But two singles and a sac fly tied things up. It’s not as though Rivera was off or anything; he threw just nine pitches to get the three outs. 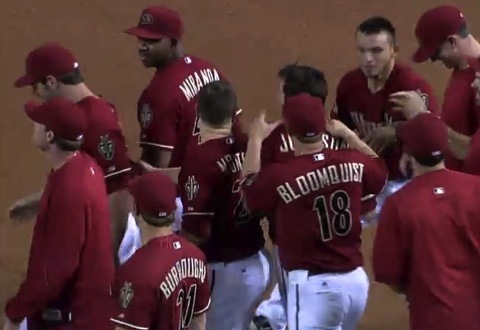 The game then dragged on for six extra frames, including four straight half innings that saw runners on second and third, or bases loaded, with no resulting runs. 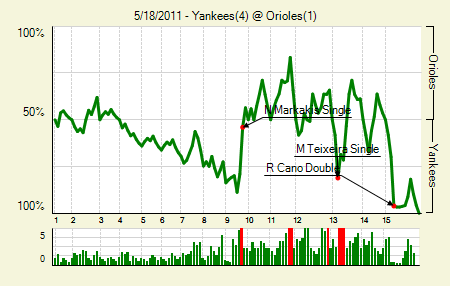 Finally in the 15th, the Yankees picked up a pair of singles before Cano scorched one into the right-center field gap. Adam Jones fumbled with the ball, which not only allowed both runners to score easily, but allowed Cano to reach third. He scored two batters later on a sac fly for some more insurance. Bartolo Colon: 8 IP, 3 H, 0 R, 1 BB, 7 K 10 GB. He had thrown just 87 pitches through eight, but when Rivera is in the bullpen it’s tough to let him just sit there. In hindsight, sure, him finishing the job seems like a better idea. But it’s hard to argue with using Rivera, especially when the lineup was coming up for the fourth time. Zach Britton: 7 IP, 6 H, 1 R, 0 ER, 3 BB, 4 K, 13 GB. Again, I’ll point to the asininity of the earned run rule. Yes, Alex Rodriguez advanced to third on an error and scored on a sac fly. But the error was in picking off Rodriguez, and while Robert Andino was charged with the error, it was a pretty bad throw by Britton. So he’s off the hook for it? Shenanigans. I’m convinced that if we were starting from scratch with stats today, there would be no earned/unearned run distinction. It’s just silly. Moving the Needle: Pedro Alvarez pulverizes one, +.256 WPA. Everything seemed normal enough. Sure, the Pirates had put on a couple of runners, but the bottom of the order was coming up, and there was already an out. And then boom. 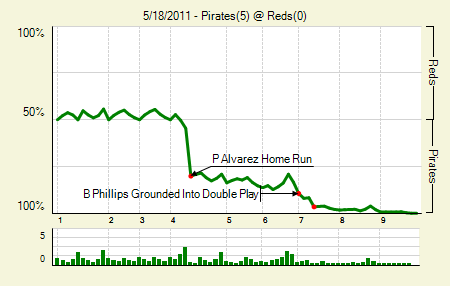 Alvarez sent one way out to the stands in right, putting the Pirates on top 3-0. That took care of business, though the Pirates would tack on a couple for good measure. Charlie Morton: 9 IP, 5 H, 0 R, 2 BB, 5 K, 15 GB. The craziness that is Morton’s season continues. At least now he has a better than 1:1 K/BB ratio. Andrew McCutchen: 1 for 4, 1 HR. And there’s the insurance. He’s now half way to his 16 home runs from last year. 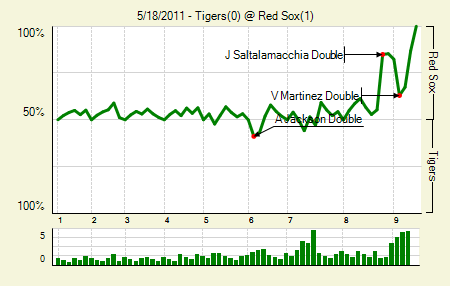 Moving the Needle: Jarrod Saltalamacchia delivers the game’s only run, +.296 WPA. Back and forth they went, scoreless through seven and a half. In the bottom of the eighth it looked like another eventless affair, as Ryan Perry retired the first two batters. Daniel Schlereth then came on to face the lefty Carl Crawford, and he walked him. The next batter, Saltalamacchia, then lined one off the wall in left-center, which allowed Crawford to score easily. The Tigers did get a chance in the ninth, as Victor Martinez doubled to lead off. But they couldn’t bring him around; Jonathan Papelbon struck out the final two hitters of the game. Clay Buchholz: 7 IP, 4 H, 0 R, 1 BB, 7 K. He has struck out 20 to just three walks in 19 innings during his last three starts. It’s no wonder that he’s also allowed only two runs. Phil Coke: 7 IP, 3 H, 0 R, 1 BB, 4 K. That’s his second seven-inning, three-hit, no-run performance of the year. I’m quite surprised that he’s transitioned acceptably to the starter’s role. He never seemed to have the arsenal to do it. Hats off to him for finding success. Moving the Needle: Jack Cust drives home the game’s first run, +.107 WPA. 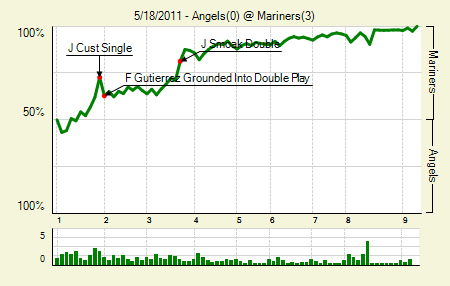 The Mariners got all of their scoring done early, which is always good when you’re facing Jered Weaver. It started in the bottom of the first, when a Chone Figgins double and an Angels error put runners on first and third with one out. Cust dunked one just beyond the infield, staking his team to a 1-0 lead. He’d add another RBI single in the third. Jason Vargas: 7 IP, 4 H, 0 R, 2 BB, 9 K. Whenever a guy with a low or middling strikeout rate fans nine, I always look to the last time he did it. For Vargas it was July 18th of last year, against the Angels. Justin Smoak: 1 for 4, 1 2B. He and Cust drove in all the runs. He also reached on an error in the first, which immediately preceded Cust’s RBI single. 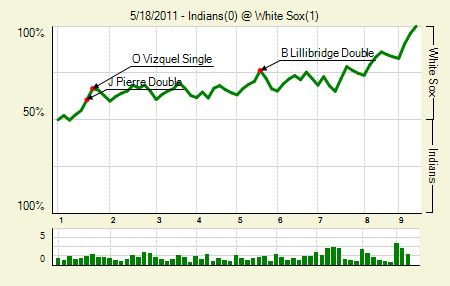 Moving the Needle: Omar Vizquel singles and moves the runner to third, +.060 WPA. Yeah, that was the WPA leader for the day, a single that set up a sac fly — which was actually worth -.008 WPA. Giving away outs, it appears, does not help your team win games. You know what does win games? Pitching. Jake Peavy: 9 IP, 3 H, 0 R, 8 K. That’s a nice effort in his second start since July 6th of last year. He actually pitched a complete game last June 19th, so it hasn’t been that long. Justin Masterson: 8 IP, 5 H, 1 R, 2 BB, 8 K. It wasn’t every bit as good as Peavy’s performance, but with the Indians offense it will get the job nearly every time. Moving the Needle: Justin Turner gives the Mets some breathing room, +.171 WPA. 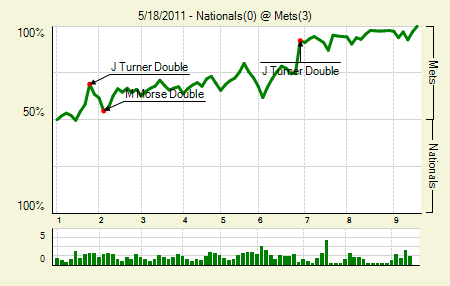 The Mets had a 1-0 lead with two outs in the sixth with the hot-hitting Turner at the plate. He had doubled earlier in the game, which preceded a sac fly. This time he took care of business himself, driving home two base runners with a double over the center fielder’s head. The Mets didn’t cruise the rest of the way, putting runners in scoring position in each of the three remaining innings. But having that insurance in hand must have made them feel a bit more at ease during those situations. Jonathon Niese: 7 IP, 6 H, 0 R, 1 BB, 7 K. We can file this one under best start of the season. It matches his season high in strikeouts, though the last time he struck out seven he also allowed six runs in four innings. The one walk is nice, too, since he had been issuing two or three per start previously. Jose Reyes: 3 for 4, 1 BB. Unsurprisingly, he scored two of the Mets three runs. Moving the Needle: Eric Hosmer ties the game in the ninth with a homer, +.434 WPA. It hasn’t been that lockdown type of season for Joakim Soria. With the game tied at two in the ninth he walked the leadoff guy and then, after a successful sacrifice, he allowed a single that scored the go-ahead run. But Hosmer bailed him out on the first pitch of the bottom half, pulling one out to right. 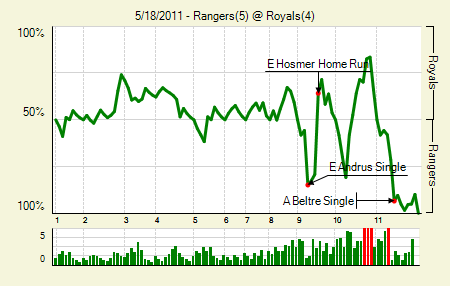 Hosmer then had a chance to win the game in the bottom of the 10th, as he came up with the bases loaded and two outs. But he couldn’t come through, and the Rangers brought home a pair in the next half inning to take the lead and, eventually, the game. Alexi Ogando: 7 IP, 4 H, 2 R, 2 ER, 1 BB, 5 K, 1 BB. In a game that featured just one extra base hit, pitching has to show up in the notables. It wasn’t a great start for Ogando, but it was good and it got the job done. Endy Chavez: 2 for 3, 2 BB. In a game with one extra base hit, the guy who got on base four times stands out. 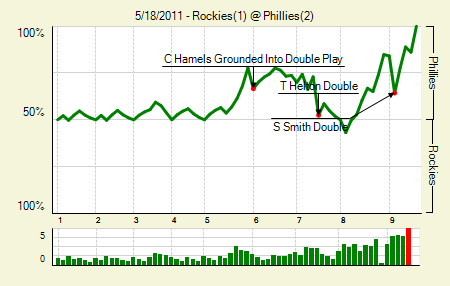 Moving the Needle: Todd Helton doubles home the tying run, +.206 WPA. I feel bad for Jimmy Rollins here. It was a low-scoring game, so every run counted. But because his sac fly, by definition, also includes an out, he gets dinged on the WPA count. Which is a shame, because it put the Phillies up 2-1 with three outs to go. Tough to get bigger than that. By the WPA, Helton’s double into the left field corner to tie the game in the top of the seventh topped the charts. 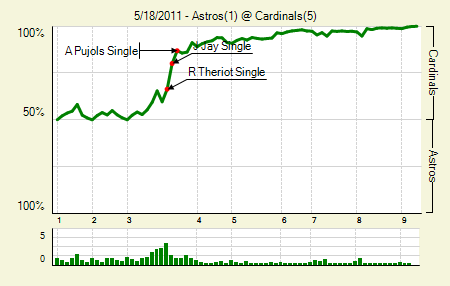 Of course, as is the case in most 2-1 games, pitching was the story here. Cole Hamels: 8 IP, 5 H, 1 R, 1 ER, 1 BB, 8 K. Since his first outing he hasn’t really had any bad starts, and has had more excellent ones than so-so ones. Jorge de la Rosa: 8 IP, 5 H, 2 R, 1 ER, 0 BB, 4 K, 1 WP. Why the wild pitch mention? Because it allowed Wilson Valdez to take third base, which set up Rollins’s sac fly. That’s a rough end to a quality game. Moving the Needle: Elliot Johnson singles home a pair, +.143 WPA. 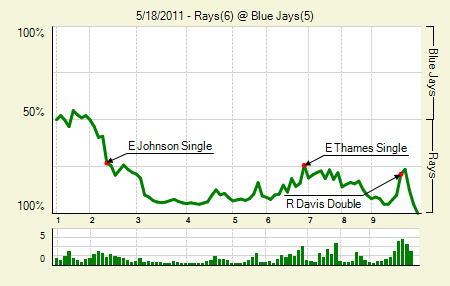 Here’s a crazy little play that eventually netted the Rays an extra run. With runners on second and third and one out, Johnson lined one to right for a base hit, easily scoring both runners. Jose Bautista threw it in, but the ball hit second base and changed directions. Jesse Litsch recovered the ball and tried to throw out Johnson, who was headed for second, but the ball went into the outfield. Johnson took third, and then scored on another error. Well, he would have scored in any case, because it was a safety squeeze. Matt Joyce: 1 for 3, 1 HR, 2 BB. One of the walks was intentional, which gives him two in two days. That’s the kinda thing that happens when you’re hitting .365 and slugging .619. Moving the Needle: Jon Jay comes through with the bases loaded, +.137 WPA. This was so close to being a double play. With the bases loaded and one out in the third, Jay grounded one back up the middle. Clint Barmes laid out for it, but the ball went right under his glove. It would have taken a spectacular play to get the inning-ending double play, but it was in the realm of possibility. Getting one, or preventing the second run from scoring, was the more likely outcome. But it snuck into center, and the Cardinals jumped out to a 2-0 lead. It would be 4-0 by inning’s end. Kyle Lohse: 8 IP, 6 H, 1 R, 1 ER, 1 BB, 3 K. His 2.17 ERA on the season is crazy, but you know what’s crazier? That he has a K/9 of 4.88 and a FIP of 3.05. I’ve seen this observation before, and doing this every morning has me thinking the same: a low walk rate deflates FIP considerably. Peter Kozma: 1 for 1, 1 2B, 1 BB. Who? In any case, he came in when Allen Craig moved to left, because Matt Holliday had to exit the game with quadriceps soreness. Lance Berkman had to leave the game, too, with wrist issues. The latter appears a bit more serious. Moving the Needle: Daric Barton throws it away, -.242 WPA. The Twins got the ball rolling in the top of the 10th when Delmon Young singled to right. Playing for one run, Alexi Casilla laid down a bunt. That’s where things went wrong. Daric Barton fielded it, turned, and tried to get Young going to second. But he threw the ball away, allowing the runners to take second and third. 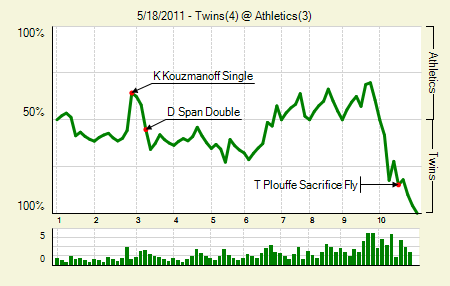 Two batters later Trevor Plouffe hit a sac fly, and that was that. Barton almost got redemption, hitting one to the warning track with two outs in the ninth. But it just didn’t have enough carry. Carl Pavano: 7 IP, 5 H, 3 R, 1 ER, 0 BB, 2 K, 12 GB. It’s been a rough start for Pavano. His strikeout rate has dipped even further, and he’s having a harder time inducing ground balls. He got that sinker working in this start, though. Ryan Sweeney: 2 for 3, 1 BB. He was pushed aside when the A’s acquired two outfielders this winter, but he’s done a marvelous job in part-time duty, a .424 OBP in 66 PA.
Moving the Needle: Greg Dobbs doubles home a pair to take the lead, +.291 WPA. 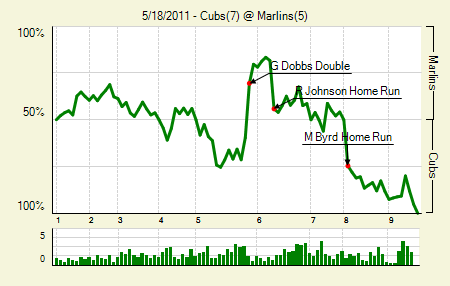 The Marlins entered the fifth down 3-1, but staged a rally to take a healthy lead. Dobbs got the big one, a double that scored two runs and turned a 3-2 deficit into a 4-3 lead. They’d add another, but the Cubs got an unexpected homer from Reed Johnson to tie it in the next inning. The Cubs made their big move in the eighth, scoring a pair to win it. Marlon Byrd: 1 for 4, 1 HR. His homer in the eighth broke the tie and led the Cubs to victory. After a blunderous game on Tuesday they kinda needed it. Kosuke Fukudome: 2 for 4, 1 BB. He’s still stuck on four doubles and no homers, yet has a .370 wOBA. Even when the .450 BABIP ends, he still has a 16% walk rate. Plus, you have to figure he’s going to run into a few this season. Right? Moving the Needle: Mark Kotsay ties the game with a ouble in the sixth, +.261 WPA. Surprisingly, Kotsay hasn’t been a complete waste of a roster spot. He does have a .378 OBP on the season, which is nice for a powerless player. Last night he got a rare extra base hit that helped change the game. With two on and one out in the sixth, with the Brewers down a run, he hammered one off the scoreboard in right field, bringing around the tying run and putting the go-ahead one on third. 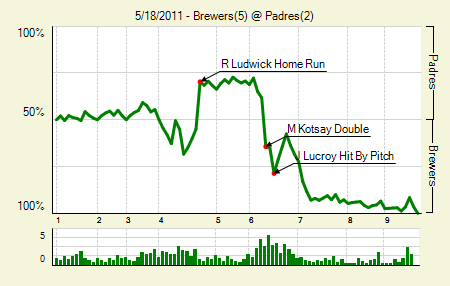 The Brewers would take the lead later that inning — on a hit by pitch, no less. Corey Hart: 3 for 5, 1 3B. It’s been a struggle for him since returning from the DL, but he has a nine-game hitting streak going on, during which he has five doubles and now that triple. Yovani Gallardo: 6 IP, 5 H, 2 R, 2 ER, 3 BB, 9 K, 1 HR. That’s his season high for strikeouts, which is only surprising because it comes from a guy who routinely strikes out a batter per inning. His strikeout rate is still below it’s normal level, but he’s brought it up a bit in his last four starts. Moving the Needle: Cody Ross breaks the tie with a three-run homer in the ninth, +.462 WPA. The Giants jumped out to a lead off Clayton Kershaw in this one, and only an eighth-inning comeback by the Dodgers made this one interesting. They got three in that frame to tie, but the Giants took them all back in the ninth. Lance Cormier just hung one up there for Ross, who demolished the pitch. Brian Wilson, who actually surrendered the RBI hits that tied the game in the eighth, closed out the ninth. Matt Kemp: 2 for 4, 1 HR. Two straight days with a homer for him. Matt Cain: 7.1 IP, 3 H, 3 R, 3 ER, 3 BB, 7 K, 1 HR. 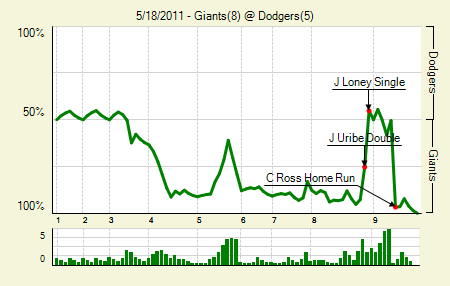 One of those runs came in the eighth when Wilson surrendered the RBI double to Juan Uribe. We hoped you liked reading The Morning After: Game Recaps for May 18th by Joe Pawlikowski! That was vintage San Diego Peavy, and it was great to see. Welcome back, hope you stick around some. Did he always get that strike at the letters in SD?